As if blindness wasn’t enough, mutations in the gene for optineurin (OPTN), which can lead to glaucoma, also appear to cause amyotrophic lateral sclerosis. Researchers from Hiroshima University in Japan report in a Nature paper posted online April 28 that they found three different OPTN mutations in people with ALS. The result of OPTN mutations—whether the motor or ocular system is involved—seems to depend on where the mutation occurs, since the two conditions do not commonly coincide. The researchers found that optineurin inhibits NF-κB, a cell death-associated transcription factor previously linked to ALS. These days, it seems that everyone is screening hundreds or thousands of genomes for disease-linked alleles. The Hiroshima team, led by first author Hirofumi Maruyama and senior author Hideshi Kawakami, framed their screen by looking for people with ALS who were the children of consanguineous marriages. That allowed them to use homozygous mapping, which can pick out a disease-linked gene from just a few affected people if their parents were related. Cousin marriages were common in the Japanese countryside 50 years ago, Kawakami wrote in an e-mail to ARF, although they are rare today. After collecting 700 DNA samples from people with ALS, the scientists focused on six individuals from five consanguineous families. They looked for loci where paired chromosomes were identical for three or more centimorgans, reasoning that any recessive allele causing disease was likely to be in these regions that were inherited from both parents. The researchers found an area on chromosome 10 that was homozygous among four of their subjects. They sequenced 17 candidate genes in the region, and found mutations in one of those, OPTN. Two people were homozygous for a deletion of the fifth exon, causing a frameshift and premature stop codon. This transcript may not produce a peptide at all, but if it did, it would drop the normally 577-amino acid protein down to just 58. Another person was homozygous for a nonsense mutation, Q398X, cutting the peptide down to 397 amino acids. Either of these mutations would abolish the parts of optineurin that bind to ubiquitin, huntingtin, and the myosin-VI transporter. In addition, when the researchers sequenced OPTN in more people with ALS, they found some were heterozygous for an E478G missense mutation, interrupting a ubiquitin-binding motif. These mutations were not present in 781 healthy control subjects, nor were they found in 6,800 people with glaucoma. The confluence of three different OPTN mutations in people with ALS is solid evidence that the mutations cause the disease, wrote Katrina Gwinn in an e-mail to ARF. Gwinn, of the National Institute of Neurological Disorders and Stroke in Bethesda, Maryland, was not part of the study. Mahmoud Kiaei of the Weill Medical College of Cornell University in New York noted that the current study does not conclusively prove the association between OPTN and ALS. It remains possible that another mutation in these subjects actually causes disease. Hits from one genome screen do not always score big in the next, he warned, and said he would like to see evidence of this mutation in other populations. But, Kiaei felt the results were certainly worthy of further investigation. Optineurin got its name thanks to its role in glaucoma (Rezaie et al., 2002). It is expressed in the eye and brain, as well as other nervous tissues. Optineurin interacts with some eight to 10 proteins, said Mansoor Sarfarazi of the University of Connecticut Health Center in Farmington. Among those interactions, optineurin inhibits the apoptosis- and inflammation-promoting protein TNF-α. This led Sarfarazi and the others who named optineurin to speculate it is normally neuroprotective, and might have a role in other neurodegenerative diseases, he told ARF. I was thrilled to see this paper, he said. More severe mutations in OPTN cause ALS, and milder mutations cause glaucoma. TNF-α activates the transcription factor NF-κB, which promotes the cell’s stress response and upregulates OPTN, creating a feedback loop. Therefore, the researchers looked for an effect of their OPTN mutations on NF-κB activity in transfected NSC-34 cells, a mouse neuroblastoma-spinal cord hybrid line. Using a luciferase reporter for NF-κB, they found that wild-type OPTN and the E50K mutation, associated with glaucoma, reduced NF-κB activity. The ALS-linked Q398X and E478G mutations, in contrast, did not affect NF-κB. Next, the researchers looked at human spinal cord samples, using immunohistochemistry to localize optineurin. 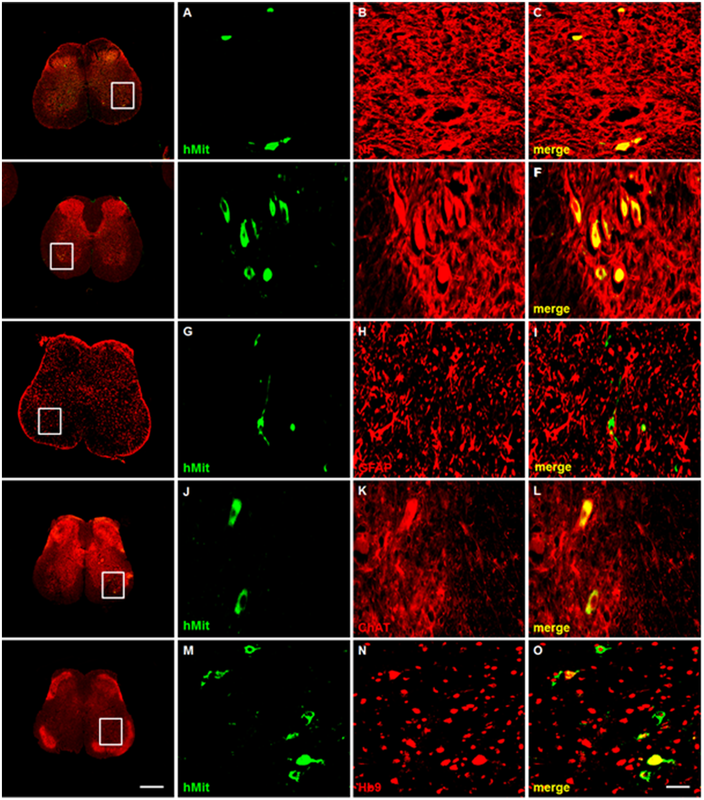 Compared to control samples of healthy tissue, the E489G mutant formed motor neuron inclusions and had increased cytoplasmic staining. Optineurin staining was also increased in both sporadic and familial ALS cases without any OPTN mutations, and the protein colocalized with both SOD1 and TDP-43, two proteins that commonly form inclusions in ALS. The authors suggest that the OPTN exon 5 deletion and nonsense mutation, which caused disease in people with two bad copies, are loss-of-function mutations. In contrast, only one E489G mutation was required to cause ALS. The tissue studies indicate this variant may increase optineurin levels and promote the formation of inclusion bodies. Doctors who treat glaucoma have not noticed an increased frequency of ALS, Sarfarazi said. Instead, he proposed that the different mutations interfere with distinct cellular processes. Glaucoma mutations, Sarfarazi noted, tend to appear near the protein’s amino terminus, affecting its interactions with Rab8 and disrupting protein trafficking. ALS mutations, in contrast, appear closer to the carboxyl end and seem to interfere with neuroprotective functions. The E50K mutation linked to glaucoma is dominant, so people who carry it have a wild-type OPTN that prevents them from suffering from ALS. The presence of optineurin in inclusions from many ALS samples suggest that it is a common component of ALS pathology. If optineurin were absent or stuck in inclusions, then it would be unable to inhibit TNF-α and, by extension, NF-κB. Therefore, the authors suggest NF-κB inhibitors might alleviate ALS symptoms. Pioglitazone, which inhibits NF-κB, is protective in ALS mouse models (Kiaei et al., 2005; Shibata et al., 2008). The scientists are also working on mice with OPTN mutations, which might provide another model for the disease (see ARF related news story on Wegorzewska et al., 2009). However, Kawakami also noted that NF-κB might not be the sole, or even primary, mechanism for OPTN mutations and ALS. Optineurin has many functions, he wrote. We cannot rule out other mechanisms. For example, optineurin is involved in intracellular transport and RNA metabolism, two cellular activities linked to ALS (e.g., see ARF related news story on Landers et al., 2009 and ARF related news story on Kwiatkowski et al., 2009 and Vance et al., 2009). NF-κB’s role in ALS was suspected before, Kiaei said, but perhaps now it should receive more attention. It highlights this pathway, he said.